In all the preceding lessons, you have learned how to write the program code in Visual Basic 2017 but we have yet to discuss the concepts of object-oriented programming that form the foundation of Visual Basic 2019. In this lesson, we shall get down to learning some basic concepts of object-oriented programming. Encapsulation refers to the creation of self-contained modules that bind processing functions to the data. These user-defined data types are called classes. Each class contains data as well as a set of methods which manipulate the data. The data components of a class are called instance variables and one instance of a class is an object. For example, in a library system, a class could be a member, and John and Sharon could be two instances (two objects) of the library class. Classes are created according to hierarchies, and inheritance allows the structure and methods in one class to be passed down the hierarchy. That means less programming is required when adding functions to complex systems. If a step is added at the bottom of a hierarchy, then only the processing and data associated with that unique step needs to be added. Everything else about that step is inherited. Object-oriented programming allows procedures about objects to be created whose exact type is not known until runtime. For example, a screen cursor may change its shape from an arrow to a line depending on the program mode. The routine to move the cursor on the screen in response to mouse movement would be written for “cursor,” and polymorphism allows that cursor to take on whatever shape is required at runtime. It also allows new shapes to be easily integrated. Visual Basic 2019 allows users to write programs that break down into modules. These modules represent real-world objects and are knows as classes or types. An object can be created out of a class and it is known as an instance of the class. A class can also comprise subclass. For example, apple tree is a subclass of the plant class and the apple in your backyard is an instance of the apple tree class. Another example is student class is a subclass of the human class while your son John is an instance of the student class. Let’s look at one example of how to create a class. 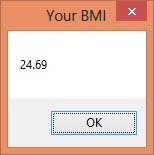 The following example shows you how to create a class that can calculate your BMI (Body Mass Index). To create a class, start Visual Basic 2019 as usual and choose Windows Applications. 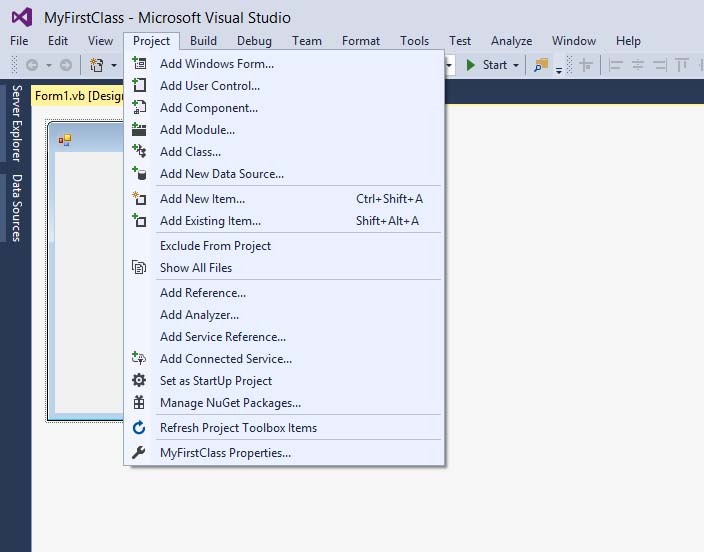 In the Visual Basic 2015 IDE, click on Project on the menu bar and select Add Class, as shown in Figure 25.1. 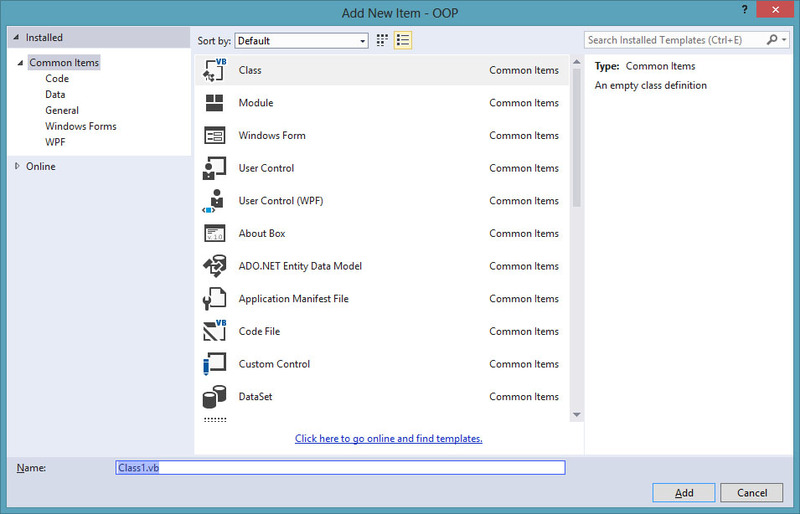 Click on the Class item and the default class Class1.vb will appear as a new tab in a code window. 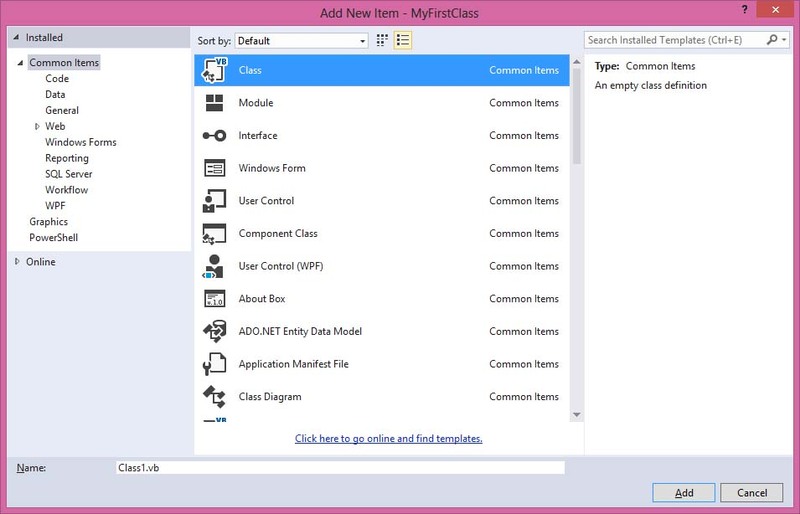 Rename the class as MyClass.vb. Rename the form as MyFirstClass.vb. 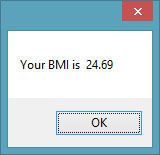 Now you have created a class (an object) called MyClass1 with a method known as BMI.